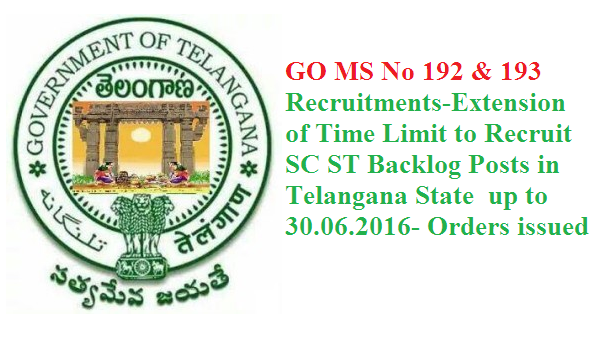 GO MS No 192 GO MS No 193 Dt 27.05.2016 Recruitment – Filling up of backlog vacancies of Scheduled Castes and Scheduled Tribes – Extension of time limit up-to 30.06.2016 – Orders – Issued. In the G.O. first read above, an adhoc rule was issued to fill-up the backlog vacancies of Scheduled Castes and Scheduled Tribes duly waiving the written examination and interview so as to fill up the identified backlog vacancies in the united State of Andhra Pradesh. The time limit is being extended from time to time, to fill up the backlog vacancies of Scheduled Castes and Scheduled Tribes upto 30.06.2014.